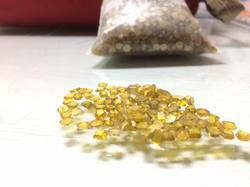 We are a leading Manufacturer of mono plate synthetic diamond and mono synthetic diamond from Surat, India. We feel immensely pleased to offer an exclusive gamut of Mono Plate Synthetic Diamond which is well polished and has been given a sound finishing touch. Our diamond has an outstanding demand throughout the jewelry industry. Clients can avail this diamond in different shapes, grade and sizes. Synthetic crystal diamond mono diamond plates is a cutting tool. This is highly acclaimed in the market for its exclusiveness and available at pocket-friendly rates. We offer our valuable clients a splendid and attractive collection of Mono Synthetic Diamond that gained acclamation for its exceptional finish. Available in different colors and shapes, this diamond processed by our experts using best quality raw material and advanced machines. Our quality examiners check the offered diamond on different parameters to ensure a faultless range at clients' end. Apart from this, this diamond is available with us at most affordable rates.